My family of five has been itching to take a major road trip. We have always been intrigued about heading west, specifically to Yellowstone. When the opportunity presented itself, we jumped on the chance for a little adventure. So off we went – two adults, a 5-year-old, 3-year-old, and 1-year-old – for the most epic road trip from Chicago to Yellowstone. Read on, be inspired, and get ready to hit the road for your very own adventure! Chicago, my hometown, offers non-stop fun for families. Get acquainted with the city and start at the popular Navy Pier where kiddos will love the hands-on fun at the Chicago Children’s Museum. After, take an architecture tour for amazing skyline views with a bit of history. If you’d rather explore the city on foot, start at Millennium Park. Take pictures at the “Bean,” then make your way to the new Maggie Daley Park, the ultimate playground for kids. Museum-lovers? A full day can be spent at the world’s largest science center in the western hemisphere, Museum of Science and Industry, or at the Museum Campus home to the Shedd Aquarium, Field Museum, and Adler Planetarium. Shop ’til you drop on the Magnificent Mile. See the city from above a double-decker bus, or better yet high above from the John Hancock Center or Willis Tower. 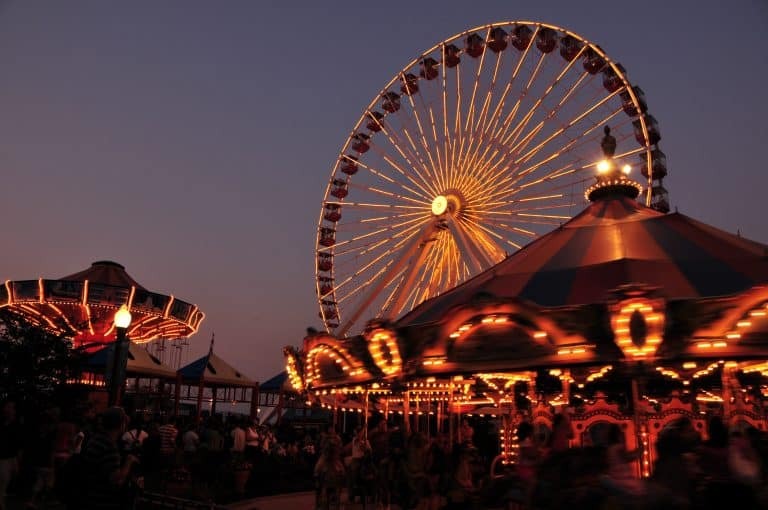 Trekaroo families have the scoop on the best way to kick start your family vacation to Chicago. Have more time? Take a walking tour through the diverse neighborhoods like Chinatown, Little Italy, and Greek Town. Read up on Top Ten Things to Do in Chicago with Kids. There are plenty of lodging options available in Chicago, depending on your budget. Stay at the Fairmont Chicago, a short walk from Millenium Park and Maggie Daley Park. For kiddie-themed rooms, a stay at the triangular-shaped hotel Swissotel Chicago will not disappoint. For a splurge, stay at the fancy-yet-family-friendly The Langham Chicago. Find more places to stay in Chicago. 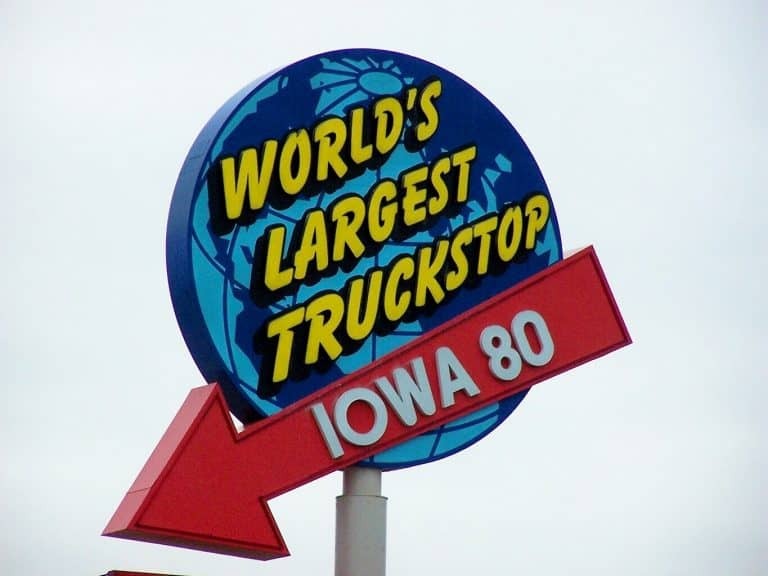 With a threshold of only three hours for our three crazy kids, the World’s Largest Truck Stop provided a much needed stop right off I-80 in Iowa (exit 284). The fast food options along with coffee, a truck store, souvenirs, and a free truck museum were a great diversion for everyone! From Chicago head west along I-80 to Iowa’s state capital, Des Moines. For a nice short stroll with ample photo-taking opportunities, head to the John and Mary Pappajohn Sculpture Park . Take a spin at the Heritage Carousel of Des Moines where rides are only fifty cents. For indoor fun coupled with a few experiments, families will enjoy the Science Center of Iowa. Parents will love the retro, family-friendly bar/lounge complete with shaggy brown carpets at High Life Lounge next to the Science Center. Not easily frightened? Try Zombie Burger for delicious burgers enjoyed with the un-dead. Have more time? Catch free art at the Des Moines Art Center or explore the rest of greater Des Moines on six hundred mile bike trails. Check out all the activities around the Des Moines area. 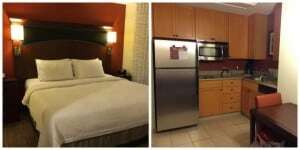 Located minutes away from Des Moines city center, the Springhill Suites West Des Moines provides a comfortable stay in large, nicely appointed suites with mini fridge, microwave, sitting area, and free breakfast. 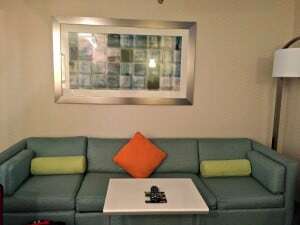 Read Trekaroo’s review of the Springhill Suites West Des Moines. See an authentic Danish working windmill in Elk Horn, Iowa. Head two hours north and stop at Le Mars, Iowa, deemed the ice cream capital of the world. Before (or after) digging into ice cream, grab lunch at local favorite Bob’s Drive-Inn, known for hot dogs topped with loose meat. 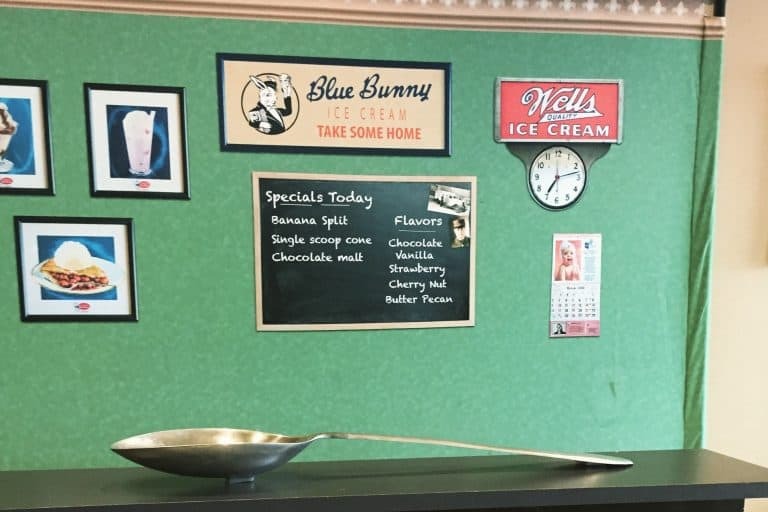 Drive down a few blocks to the Blue Bunny Ice Cream Parlor taking note of all the ice cream sculptures located throughout town. 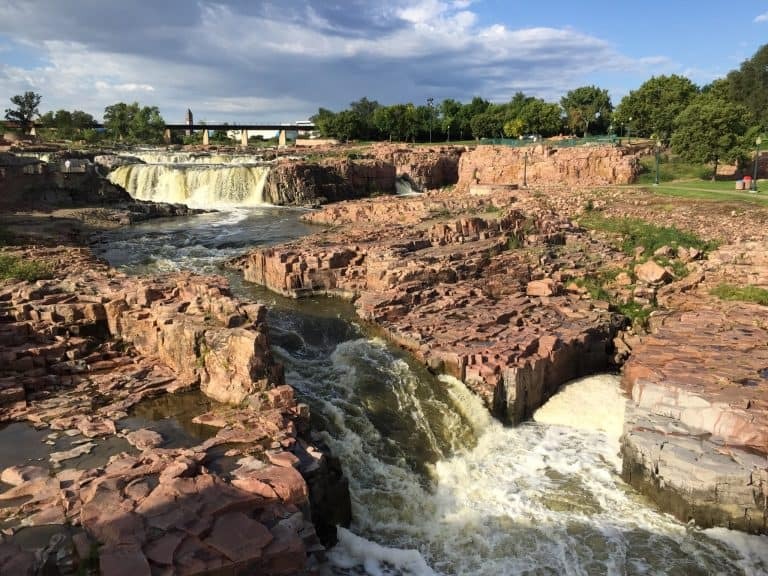 Located near the South Dakota/Iowa border, Sioux Falls offers a lot of fun for families. As the city’s namesake, Falls Park is a must see to view the falls splashing down over 100 feet. For outstanding panoramic views, visit the five-story visitor center. 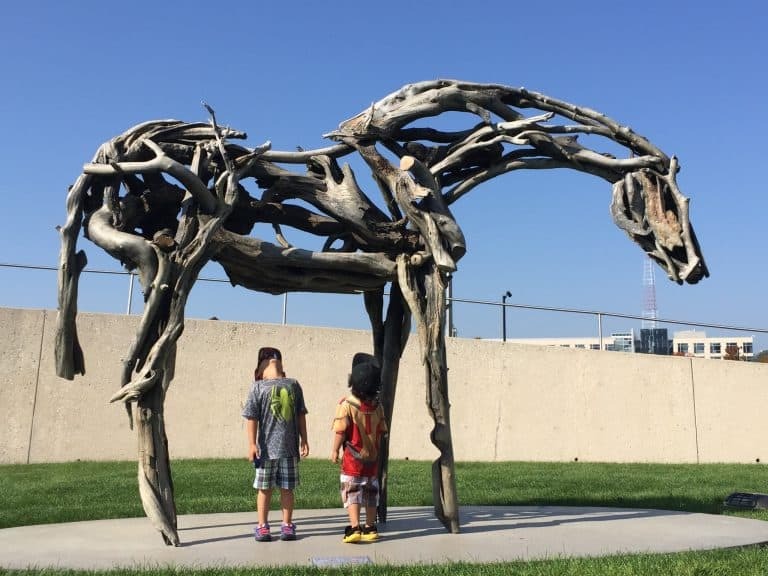 Take a stroll down the SculptureWalk to see sculptures on display and vote for your favorite piece to be added to the city’s permanent collection. For hours of hands-on fun for both kids and adults, the Kirby Discovery Center at Washington Pavilion won’t disappoint. Don’t forget to say hi to Stan, the T-rex, or catch a flick at the Cinema Dome. This former high school is also home to a performing arts center, theater, and visual arts center. 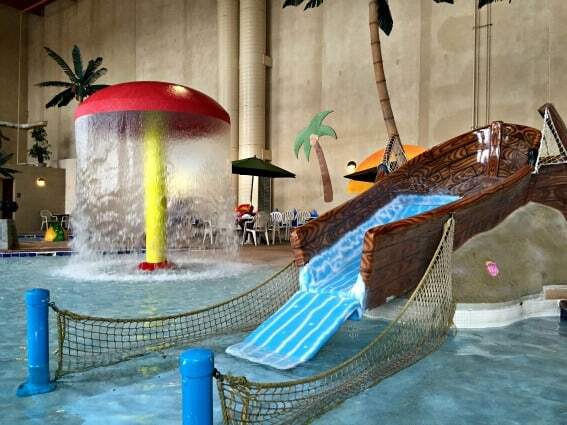 Discover the top-rated kid-friendly activities in Sioux Falls. Have more time? 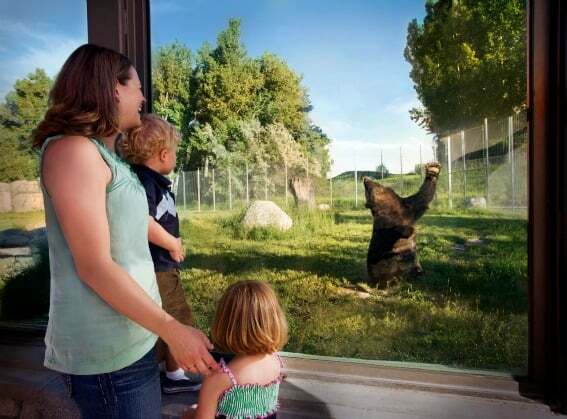 Spend time getting to know more than 1,000 animals like anteaters and rhinos at the Great Plains Zoo. Save time to visit the Delbridge Museum of Natural History included with the zoo admission. The new Comfort Inn & Suites in Sioux Falls provided a great place to relax after a day of traveling. It was clean, comfortable, and offered free breakfast. One of the best Comfort Inns we’ve ever had the pleasure of visiting. 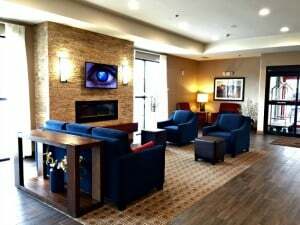 Read my full review of Comfort Inn & Suites in Sioux Falls. This leg of the trip from Sioux Falls to Rapid City has plenty of fun road trip stops. 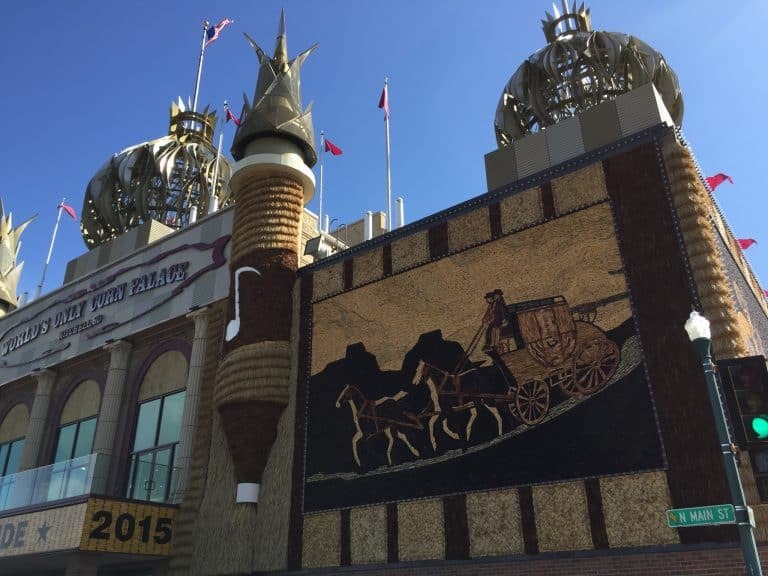 Your first stop is the world’s only corn palace in Mitchell. Check out the sides of the building with murals made with ears of corns and other grains. Al’s Oasis is also a nice pit stop with everything you need – a grocery store, general store for great souvenirs, clean restrooms, plus a great place to grab food like a bison burger, five cent coffee, or a delicious strawberry pie. After seeing mile after mile of prairie land on I-90, the stark contrast of the rugged peaks of the Badlands National Park was a welcome sight, and quite easily one of our favorite pit stops of our road trip. Stop by the Ben Reifel Visitor Center for a potty break and learn more about the animals and plants native to the park. One of the highlights of the 51-mile loop was taking the unpaved path on Sage Creek Rim Road to see prairie dogs, buffalo roaming freely, and other wildlife. Follow the loop back to the town of Wall and see what all the fuss is about at the unique Wall Drug. Before you go, make sure to check out this one-day Badlands National Park itinerary with kids! 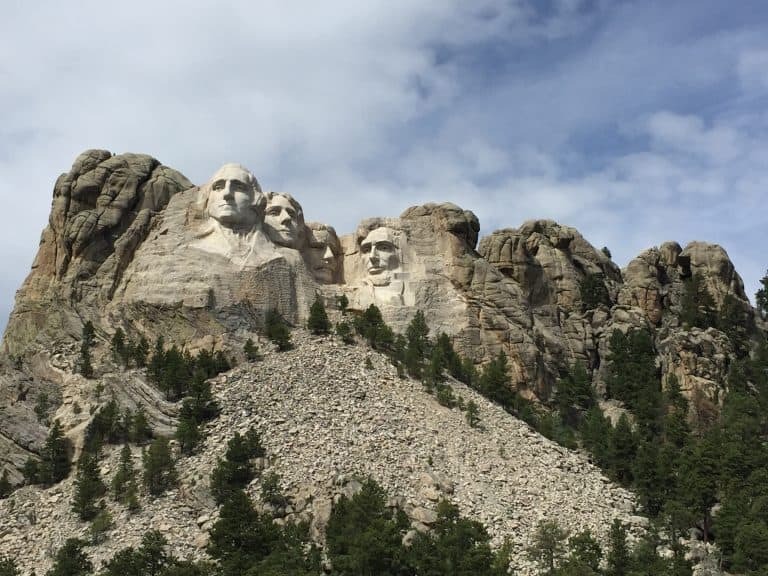 Rapid City is a wonderful base camp to explore the Black Hills, Badlands, and Custer State Park. No visit to the area is complete without seeing Mt. Rushmore, but don’t you dare forget to grab a vanilla ice cream from the Jefferson Memorial Ice Cream shop located on site. Word is they use Jefferson’s first vanilla ice cream recipe! Ready for a fantastic drive? Follow the loop through Custer State Park where you will more than likely encounter burros, prairie dogs, and buffalo. If time allows, drive through Needles Loop to experience hair pin turns and oh-so narrow tunnels. Stop by Crazy Horse Memorial, not far from the Needles loop, to see the world’s only monument in progress. Want to see bears? Our visit to Bear Country USA was quite honestly one of the most memorable parts of our trip. This drive-through park wows visitors with up-close views of animals such as arctic wolves, big horn sheep, and mountain goats that call the park their home. After driving through parts of the 200-acre park, get out on your own two feet to see baby bears, baby wolves, and other baby animals. End the day at Fort Hays Chuckwagon for toe tapping music, raunchy skits, and food served on tin plates. Fuel up with coffee at Alternative Fuel, then get ready to spend the day exploring Rapid City. Find sculptures of presidents hanging out at each corner, then veer off between 6th street and 7th street to scope out awesome art at Art Alley. Dinosaur Park has been luring travelers and dino lovers since the 70s with their life size dinosaur sculptures. End the day trying regional food like elk ravioli and one of the best bison prime rib you’ll ever have tasted at Dakotah Steakhouse. Have more time? For another blast from the past that kids will adore, visit the whimsical Storybook Park in Rapid City or see reptiles at Reptile Garden. A stay at the western themed Best Western Ramkota managed to be one of my kids’ favorites for our entire road trip primarily due to the splash-tastic waterpark attached to the hotel. My young kiddos enjoyed exploring the pirate ship and water play toys, sliding down the boats, and splashing around the zero depth area. Older kids and adults seemed to enjoy taking a plunge down the huge water slides located a few stories high. Read kid friendly reviews of the Best Western Ramkota on Trekaroo. If time allows, the infamous town of Deadwood beckons with its rich Wild West history. Take a quick detour to Mt. Moriah Cemetery and see the graves of Calamity Jane and “Wild Bill” Hicock. 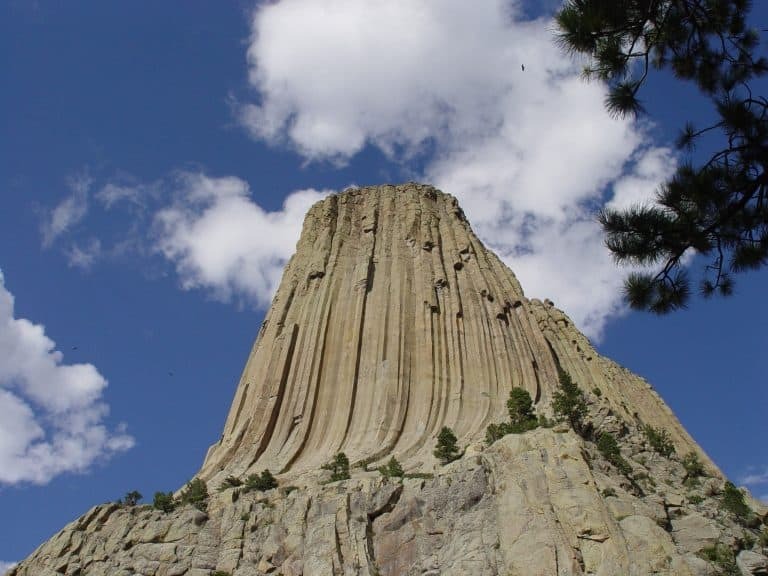 Head west for another worthwhile stop at Devil’s Tower National Monument, a flat top volcanic formation also known to some as a sacred place. Kendrick Park in Sheridan, Wyoming, is a great place to stretch the legs and also grab an ice cream treat. Time didn’t allow us to explore the area fully, but if we had time we would have loved to explore the Pictograph Cave State Park with drawings that date back to more than 4500 years ago. Animals native and not native to the area call ZooMontana their home. Miles of user-friendly trails are waiting to be explored from hiking to biking on Montana’s Trailhead. Find more things to do in Billings, Montana with the family. The Billings Residence Inn has everything a family would want – a clean suite, a kitchen with full fridge, oven, dishwasher, great sitting area, and a much needed laundry room. It even had a basketball court and fire pit. The friendly staff and great amenities made this subtle Western-themed hotel one of our favorites! Read more about the Billings Residence Inn on Trekaroo. Head southwest to the town of Bozeman, the home of Montana State University. Take a stroll through downtown Bozeman to find tons of cute eateries and shops. 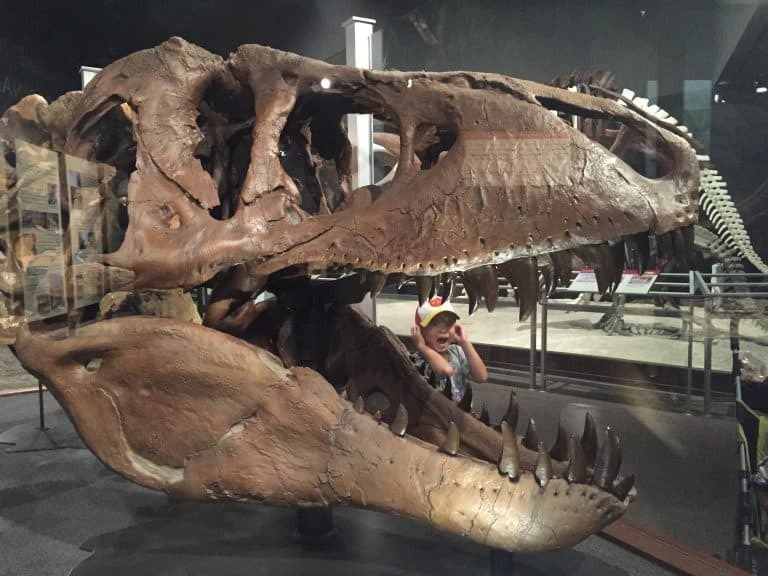 With two dino-lovin’ sons, we couldn’t leave without stopping by the Museum of the Rockies. Not only did the dinosaur exhibit and lab rule, but the kids had a blast learning all about Yellowstone in their kids section, the Discovery Center. Yay! You made it! To do Yellowstone justice, more than two days should be dedicated to exploring America’s first national park. The lower “loop” with its geysers, bubbling mud pots, and springs was a sight not to be missed. Don’t forget to see the most iconic of them all, Old Faithful Geyser. Travel through the rest of the park to see rivers, waterfalls, canyons while spotting some wildlife. Find more things to do in Yellowstone. 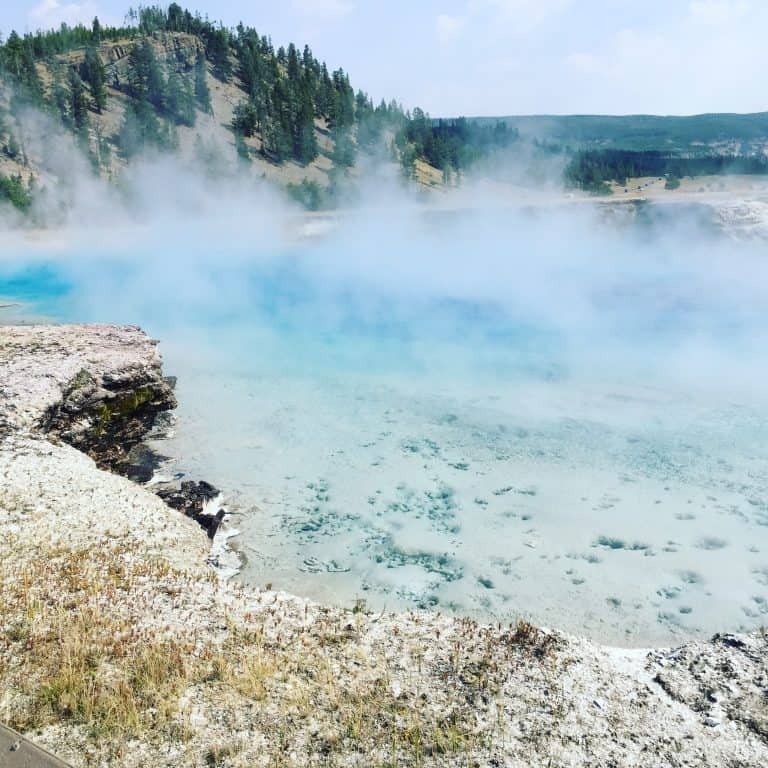 Find off the beaten path things to do with the family in Yellowstone. 45 minutes from the West Yellowstone entrance, Big Sky Resort in Big Sky, Montana, was an ideal base camp for our adventure to Yellowstone. 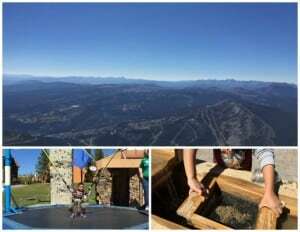 The resort offers plenty of activities to keep young kiddos busy, like a bungee jump and gem stone mining. Feeling more adventurous? Fly through the forest on the zip lines or challenge yourself with a high ropes course. 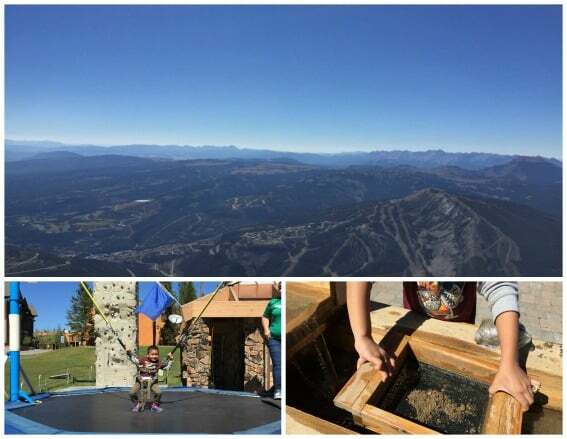 Our family’s favorite activity included the Lone Peak Expedition where we got on a ski lift, rode on a jeep, and finally was whisked away on a tram to reach the summit for magnificent and breathtaking views from above 11,000 feet high. 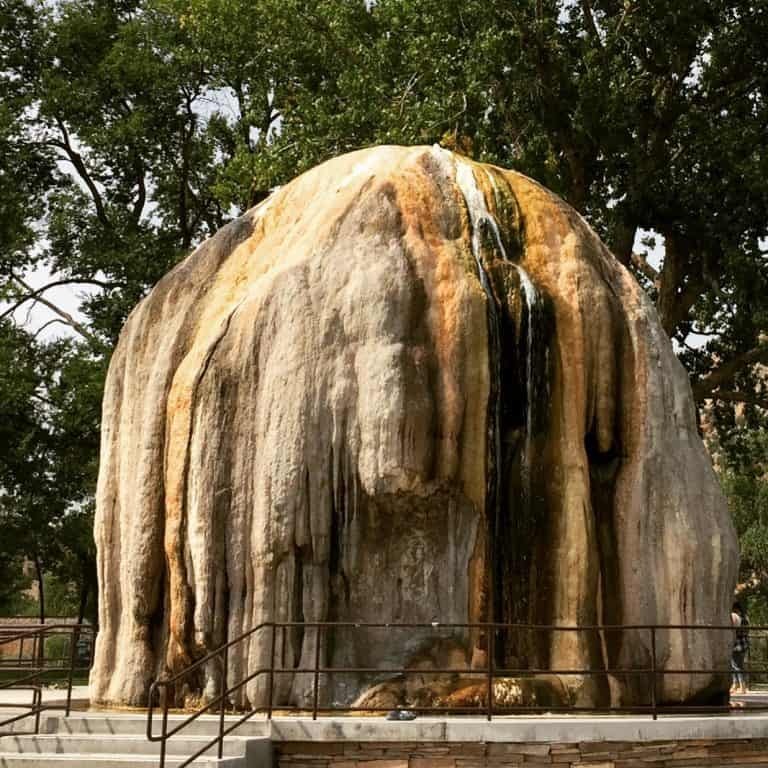 Our Wyoming itinerary didn’t originally include Thermopolis, but boy were we glad to have stopped. Deemed the hot springs capital of the world, these hot springs have healing powers so a dip is a must. Afterwards dig for dinosaurs at the Wyoming Dinosaur Center and come face to face with a Supersaurus. The ride from Thermopolis to Cheyenne through Wind River Canyon may have been one of the most beautiful drives our entire trip, with beautiful vistas and turn offs to take everything in. 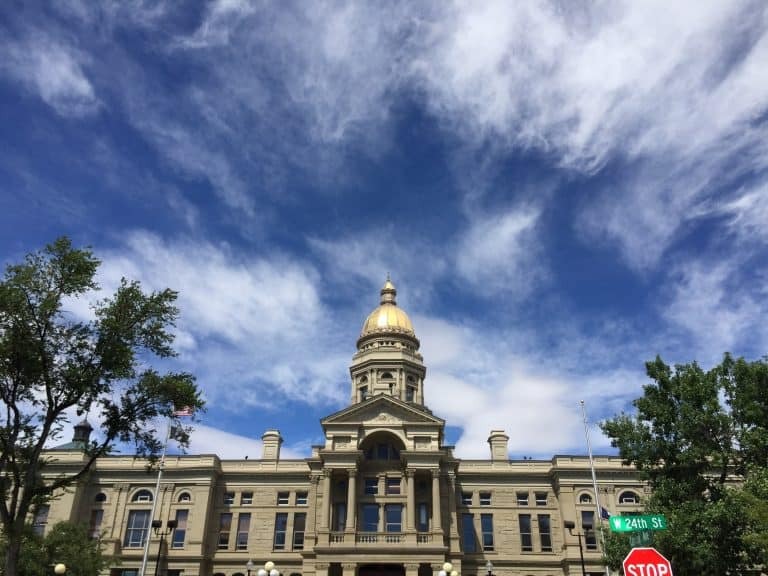 Our next stop was Wyoming’s state capital of Cheyenne. We could only squeeze in a couple of attractions in this Western town, so we thought it would be best to stick to exploring the downtown area. We visited the former train depot turned visitor center/museum and took a few photos of the boot sculptures. Looking for western wear? The Wrangler down the block from the depot will fit your needs, from cute cowboy boots to fancy cowboy hats. Grab bubble tea from Paramount Café, housed in a former theater. Then, head to Holiday Park where the retired Big Boy Steam Engine calls home. See what else you can do in Cheyenne with the family. 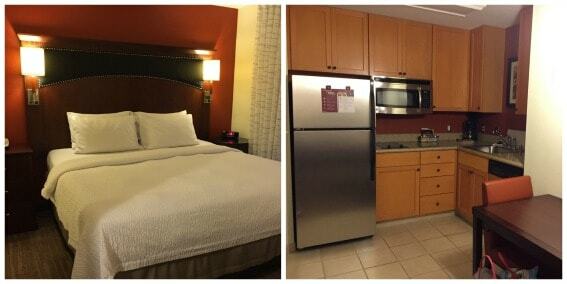 The Springhill Suites Cheyenne was exactly what we needed after a day of driving. Located right off the highway, the stylish all-suite hotel was clean and comfortable, with a spacious sitting area for the kids to run around. Fort Cody in North Platte, Nebraska provided a very interesting stop that included Buffalo Bill’s Miniature Wild West Show, a mini-exhibit that took 12 years to create, a two-headed calf, and all the souvenirs you could ever want. Train fans should stop by the Cody Park Railroad Museum or Golden Spike Tower overlooking the world’s largest rail yard. Try a runza, Nebraska’s local take on fast food. How cool would it be to be in two states at once? 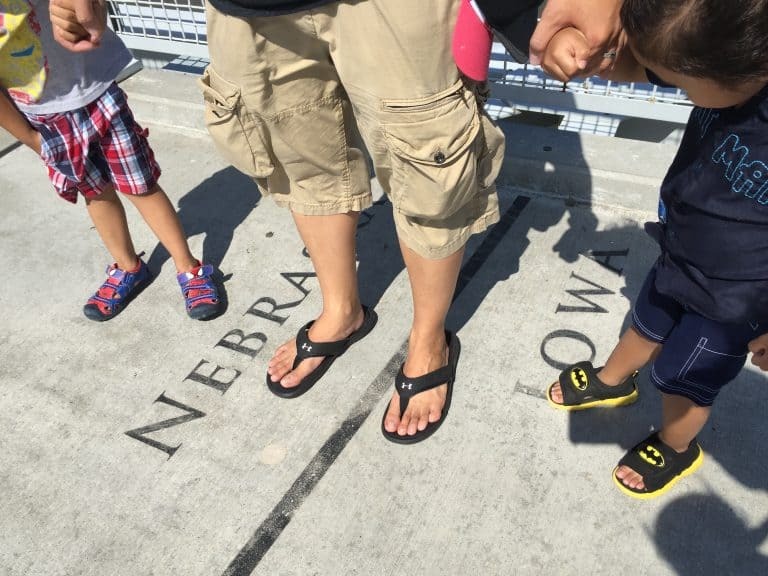 Step foot onto the Bob Kerrey Pedestrian Bridge, the longest pedestrian bridge to link two states, giving you the opportunity to step one foot on Iowa and another in Nebraska. The Lewis and Clark Visitor Center on the Omaha side is worth the stop to learn about the famous duo’s trail. Have more time? In Omaha, spend the entire day at the highly-rated Henry Doorly Zoo, or admire a few works of art at the Joslyn Art Museum. 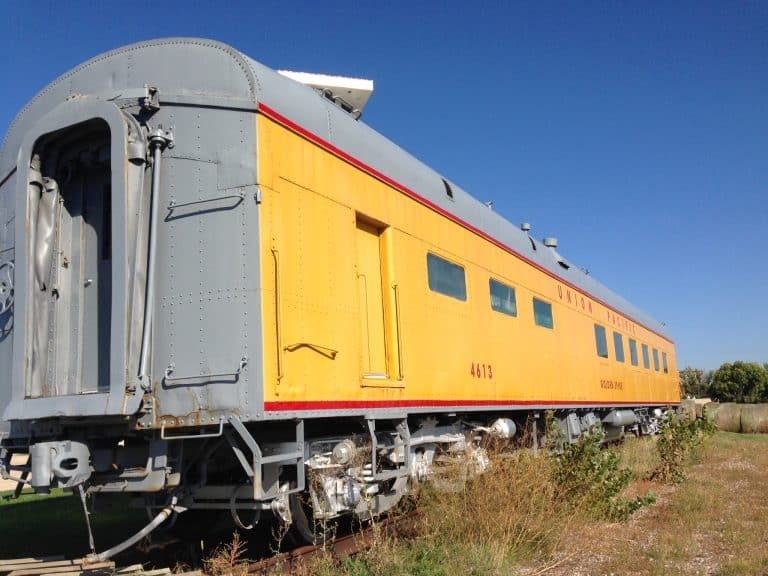 On the Council Bluffs side, attractions like the Union Pacific Railroad Museum or Railswest Railroad Museum will appease your train fan, or check out the unique Rotary Cell Jail. Save room for dessert at Christy Creme for an ice cream treat. See more family-friendly activities in Omaha. Stay at the all-suite hotel Springhill Suites Council Bluffs located right off the highway. If you’d like to stay on the Omaha side, don’t miss a stay at the brand new Home2 Suites Omaha. 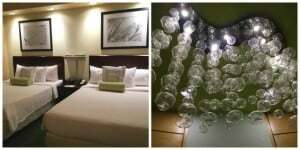 Aimed at stylish and thrifty travelers, we definitely found a home away from home that was perfect for our family. Congratulations! You’ve reached the tail end of the trip. For one of the coolest rest stops throughout Iowa (and our entire trip), visit the rest area before exit #73/Tiffin to see Iowa written in cursive across the building. Make the Quad Cities your final stop for fun at the fabulous Family Museum and Lagomarcino’s for a hot fudge sundae served with a small pitcher of hot fudge on the side. A nice way to end the most epic vacation ever. Ready to plan your own epic road trip from Chicago to Yellowstone? Use this handy list for your guide. 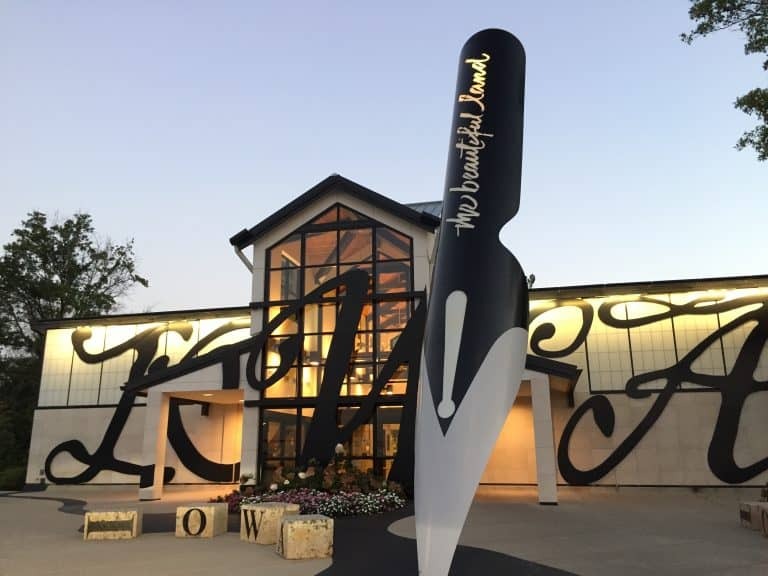 Disclosure: Many thanks to Visit Sioux Falls, Visit Rapid City, Big Sky Resort, and Kinseth Hospitality who hosted us for the purpose of writing this article at several hotels and attractions. I was not required to provide any specific review and all opinions are my own. This post is so inspiring! I love a good road trip and now I really want to plan another trip to Yellowstone. Thanks for sharing. Sounds amazing! How long did the trip take you round trip? Hi, I am looking into this for our family of four (two adults and two under two, currently). When we take the trip next year they will be a bit older. I’d like to reach out to hear more about your packing strategy as well as how you manage the kids in the hotel rooms. We aren’t sure how our two will do with us all in the same room.